After three episodes into Mob Psycho 100 S2, we’ve got three gems of different kinds. And yet it feels like the show has barely just begun! 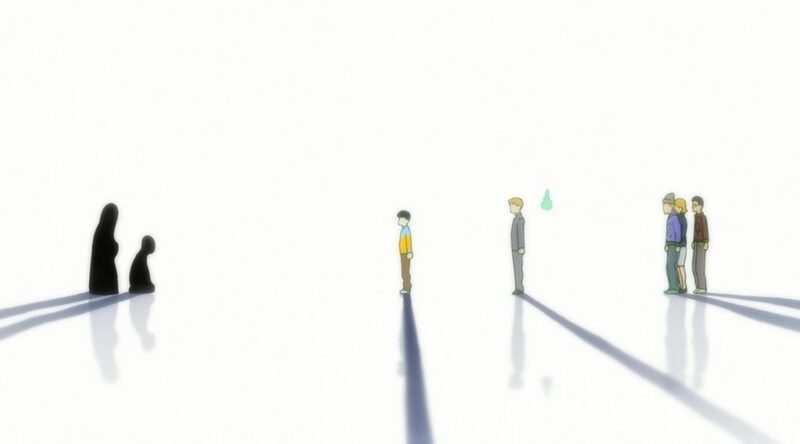 ─ The third episode of Mob Psycho 100 S2 was brilliantly constructed in retrospect. It first presented a number of short and seemingly unrelated vignettes, yet by the end all thematical dots connected, illustrating the new struggle inside Mob’s head in a clear way and also giving the viewer that satisfying feeling of realizing what the goal had been all along. Forced to confront many forms of evil – or are they? – Mob’s entire worldview’s taken quite the hit; the strong direction managed to give gravitas to the moral dilemma he’s forced to deal with, which made the quantifiable impact on his psyche (as explicitly shown by the jump in the percentage counter) feel entirely deserved. As someone doing their best to stay away from the source material so that this adaptation can surprise me as much as possible, I can’t say whether this experience will heavily influence the story down the line, but it’s no secret that something very big is coming up in the next two episodes, and this one felt like a great lead-up to that. 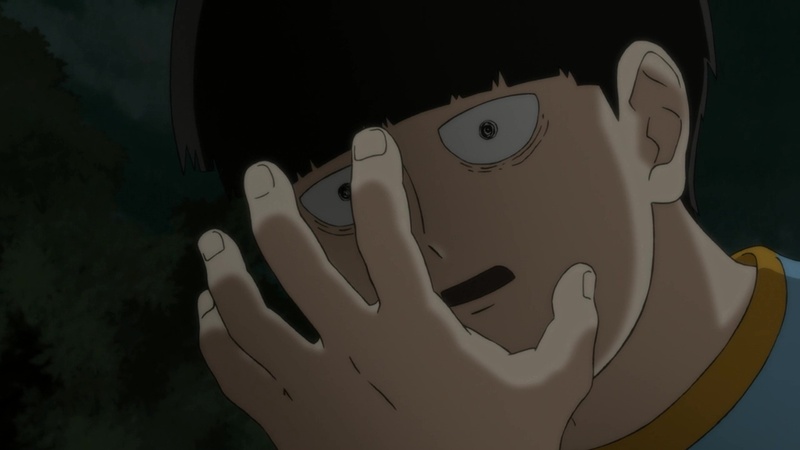 We’ve gotten a clear picture of Mob’s inner thoughts and the struggle he’s facing, so all that’s left is working towards a conclusion. And the one we all want is this good boy to be happy. ─ Kenichi Fujisawa, whom you might remember as the main figure behind season one’s spectacular fight between Mob and Teru, returned to storyboard and direct this episode. It was quite interesting to see him tackle something this far removed from his wheelhouse; Fujisawa is an action specialist to the core, both as an animator and as a budding director, but episodes like this prove that talented individuals can always surprise you with new additions to their skillset. From the spot-on comedic timing – special mention to the downright hilarious scene where Mob’s friends rushed to protect him from the bullies – to the nearly suffocating climax part, the episode didn’t have a weak moment despite the tone first appearing to be all over the place. And much like Fujisawa’s previous episode, the aesthetics were very clean, standing out from the norm by taking the thin outlines and simplified drawings further than usual. All things considered, an excellent mix of elements that viewers usually expect from Fujisawa and exploration of new registers for him, all with similarly strong results. ─ If you have a good memory, you might have noticed that the crew of animators assembled for this episode was very similar to Fujisawa’s season one outing. The biggest difference was of course on the animation director’s seat: Shin Ogasawara took on the role for the first time in his career, which turned out to be a very fitting debut considering his knack for authentic acting regardless of stylization. 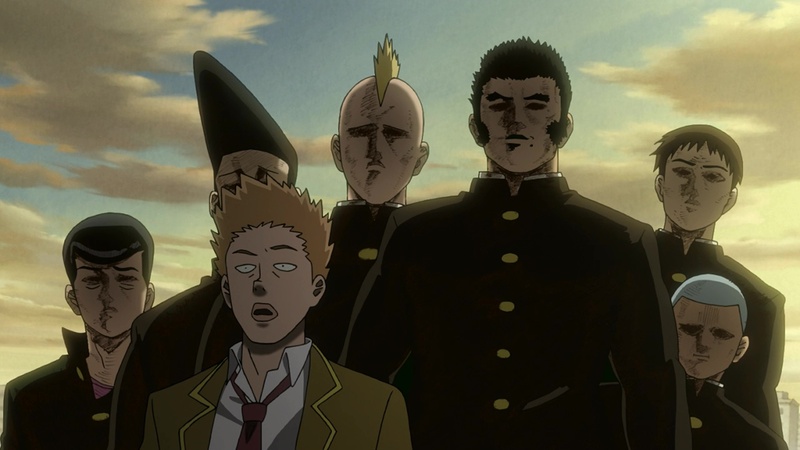 In comparison to Yoshimichi Kameda’s work on the previous episode, Ogasawara’s supervision wasn’t as strict and allowed the idiosyncrasies of individual animators to surface more noticeably; sure you can spot countless instances of amusingly round Reigen faces throughout the episode, but otherwise all sequences where the individual personality of the key animators leaked through had their identity left intact, as Ogasawara’s main worry was consistent quality over unified style. Very impressive debut – and my hunch tells me it might not be the last one we’ll see this season! ─ Since Ogasawara did such a good job at protecting the individual styles of key animators, this is a good chance to examine their work on some particularly impressive scenes. 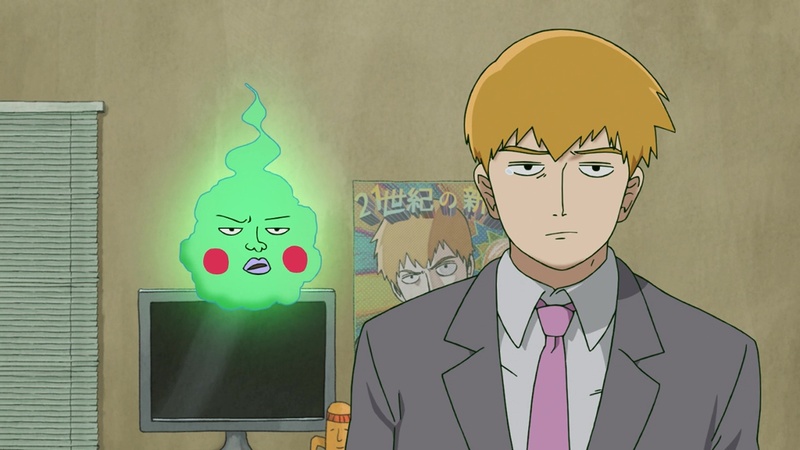 That includes the animation director himself: it was Ogasawara who animated the unsettling meeting with the neighbor who was creeping on Reigen’s client. Yet another impressive display of his acting animation capabilities, especially with the close-up on the guy’s nervous face as his crimes are about to be exposed; Ogasawara can evoke photorealistic expression even with rather simple designs, which makes that moment all the more disturbing. If that entire segment was to your liking, I’d also like to highlight that Hiromitsu Seki animated the scene shortly before… to the surprise of absolutely no one, as it once again has his signature ambitious camera movement and tricky background animation. It’s not as if he’s a one trick pony, but his specialization is so well-known that we’ve gotten to the point where certain scenes are storyboarded specifically because the directors know they can reach out to Seki. ─ Moving on to the rest of the episode, another clear animation highlight would be the aforementioned scene with the bullies trying to mug Mob, handled by ex-Dogakobo ace Yuki Watanabe. His strong animation fundamentals come across in details like the body motion and the feeling of volumetry when the mugger edges towards the camera, but once again it’s Watanabe’s delightful cartoony nonsense that carries the entire scene. The situation is funny in and of itself, but the fact that you could mute the scene and it would still be a self-explanatory, amusing gag proves just how good Watanabe is when it comes to this. He’s not the only one who lived up to his reputation, since we also got one of the most ambitious usages of Miyo Sato‘s paint-on-glass animation yet in a scene where it seamlessly intertwined with classically drawn background animation. And despite not appearing in the credits, it seems that the legendary Norio Matsumoto animated the culmination of the scene with ghost family. 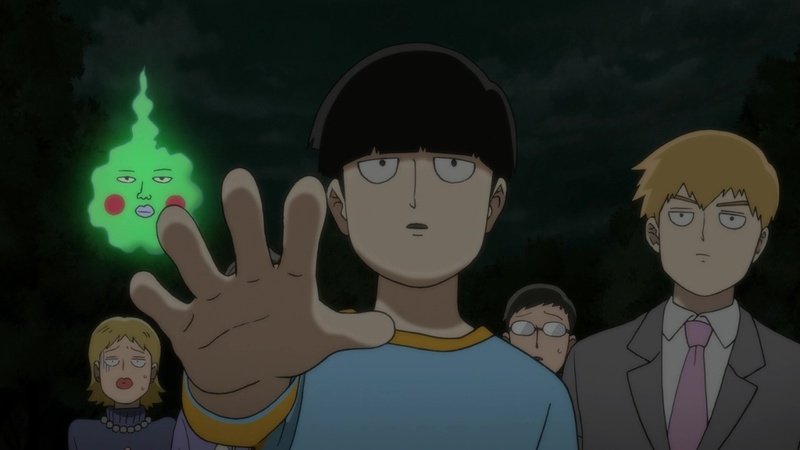 The subtle movement on Mob’s shaking hand, that close-up to his face and Reigen throwing salt on the clients – the feeling of volume and nuanced movement are very much Matsumoto’s own. It’s a bit of shame that this production featuring so many uncredited artists makes attributing scenes so tricky, so we don’t quite know who animated this terrifying transformation of the ghost dad yet. Striking episode and really insightful write-up. Thank you very much. I remember last season in episode 5, Norio also made a seemingly uncredited appearance. Guy doesn’t want people to know what he is up to it seems. Also, one question. Which of the two episodes, this week’s One Piece or Mob Psycho’s Ep 5, will have the more impressive episode according to some rumblings you might have heard of? While I’m sure One Piece will have a strong episode today, Mob’s fifth episode will easily take the crown. It won’t even be a competition. “It won’t even be a competition”. Wow, that’s quite something. I trust your judgement, but that sounds almost too good to be true. Really excited now. But that would certainly explain why Bones is doing a whole event out of the next two episodes. You know, I never got why animators get left out of the credits. Is there a reason? Or is it just out of laziness/poor planning?